The LP collector is an economical low pressure utility cartridge collector with all the quality design features you have come to expect from Scientific Dust Collectors. The LP is a pulse jet cartridge collector with 2, 3, 4, or 5 cartridges for nominal air flows from 1,000 to 3,000 CFM. 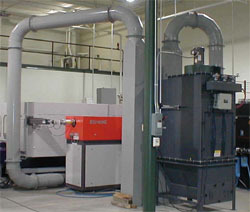 The unit features all welded construction and Scientific Dust Collectors' patented nozzle based cleaning system. The unit features a generous access door to change the cartridges and integral hopper drawers with ample storage. Cartridges are secured and changed without the need of tools via a simple latch and threaded spring loaded handle to assure proper sealing. All LP collectors are on-line self cleaning units with a solid state timer board for the cleaning system. Standard features also include a generous compressed air manifold for the cleaning system and a high quality direct drive industrial fan.